Stop to watch the workers. Pass the construction zone carefully and not “rubberneck." To avoid contributing to chronic traffic congestion, you should not "rubberneck." That is, you should not slow down to look at out-of-the-ordinary things. You may stop in a travel lane when letting out a passenger. Do not stop in travel lanes for any reason (confusion, breakdown, letting out a passenger, etc.). Continue moving until you can safely pull off the road. It is legal to go faster than the speed limit when passing another vehicle. It is always unlawful to exceed the posted speed limit, even when passing another vehicle. When driving in a business or residential area, the maximum speed limit is 30 miles per hour. If a different speed limit is posted, follow the posted speed limit. The road ahead curves left, then right. The road ahead curves right, then left. 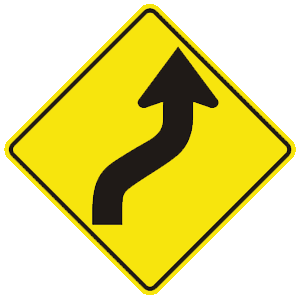 This sign indicates that the road ahead curves to the right and then to the left. You should slow down to be able to negotiate these curves safely.